Want Credit Card Grout Joints? First Check Tile Industry Standards. Yes, credit card joints are popular, but given tile industry standards, they aren't possible, appropriate or even recommended. Many installers have had customers who have seen tile installations in a magazine or brochure which is exactly what they want in their homes. 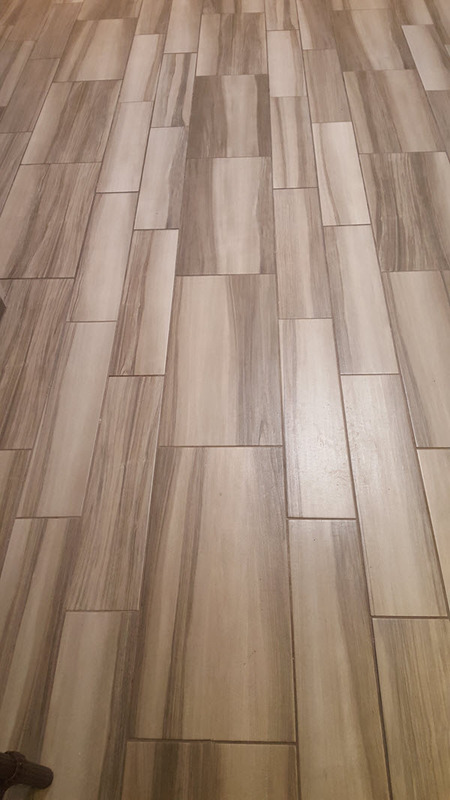 Unfortunately, the “look” they want to achieve with credit card thickness grout joints most likely will not be possible using the tile that has been selected. How Does Tile Selection Affect Grout Lines? Depending on the dimensional consistency of the tile selected, and if it was tested to the requirements of the American National Standard Institute (ANSI) A137.1 specifications, the size of the grout joint can be determined. Natural tiles are packaged directly after manufacturing and are not sorted by size. Calibrated tiles are sorted after production to meet a specific range of size. Rectified tiles are taken from the production line and mechanically finished. As Sal DiBlasi explains in this 1:28 minute video titled Rectified Tiles Explained, rectifying tile ensures that the overall tile size is more precise. Rectification does not affect the thickness of the tile, only the edges. That means rectified tile is better suited for situations where thinner grout joints are desired. 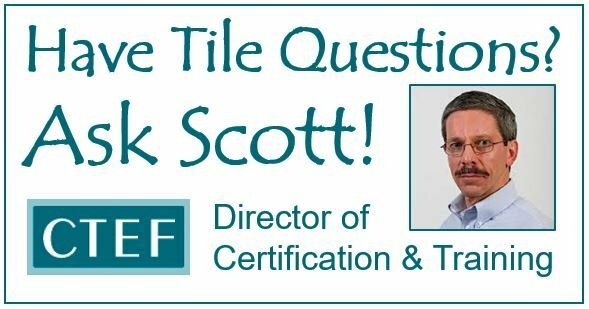 >> See What is Rectified Tile and Why Does It Matter for Your Tile Installation? for closeup images of rectified and non-rectified tile. The rectification process grinds the edges of the tile to achieve a more precise facial dimension. The grinding makes the sides parallel to each other and sized to a specific dimension such as a large format plank tile as seen in photo below. "Tiles (square or rectangular) with any side greater than 15 inches (as are the tiles in the photo), the grout joint shall be, on average, a minimum of 1/8” for rectified tiles and, on average, a minimum of 3/16” wide for calibrated (non-rectified) tiles." What about Calibrated Tile and Credit Card Joints? If the customer selects a calibrated tile which, according to the ANSI A137.1 Specifications, can contain tiles that range in size within a defined tolerance in the various sized tiles in same box, for the project and requests that the grout joint be the thickness of a credit card (1/32”), the installer will have a very difficult if not impossible task. Using such a narrow grout joint with tiles that vary in size could have two larger tiles side by side that actually touch each other with no grout joint, while two smaller tiles side by side could show a grout joint of over 1/8” or more (four times the requested 1/32”). This is where another ANSI specification, A108.02- 4.3.8, defines the required minimum grout joint size. “To accommodate the range in facial dimensions of the tile supplied for a specific project, the actual grout joint size may, of necessity, vary from the gout joint size specified. The actual grout joint size shall be at least three times the actual variation of the facial dimensions of the tile supplied. Example: for tile having a total variation of 1/16” in facial dimensions, a minimum of 3/16” grout joint shall be used. Nominal centerline of all joints shall be straight with due allowances for hand-molded or rustic tiles. In no circumstance shall the grout joint be less than 1/16”. As per the above example, a tile with just a 1/16” variation in size requires that the grout joint be 3/16”, which is significantly wider than the consumer desired 1/32”. However, if the costumer selects a rectified tile, the opportunity for success is much greater. Why? Because of the more precise facial dimensions. Installers need to know these specs and use these details to their advantage. Allowing a consumer to dictate the grout joint size without regard to these industry guidelines, is a recipe for failure which can lead to a disaster. Know the rules and eliminate these problems from your jobsites. How Do You Use Tile Industry Standards? Your goal as a qualified tile contractor is to communicate to customers how tile industry standards affect the success of a tile installation. As desirable as a credit card joint may be, using these standards to educate customers will show them the better way to complete a high quality tile installation which will stand the test of time. When your customers realize you know your stuff and you don’t waffle on these established best practices, they should thank you for providing options that eliminate a possible failed installation. If you're looking for a qualified installer, be sure to use the CTEF zip code locator to find a CTI near you so you get it done right the first time.